It is so great to be back at an IB World School. 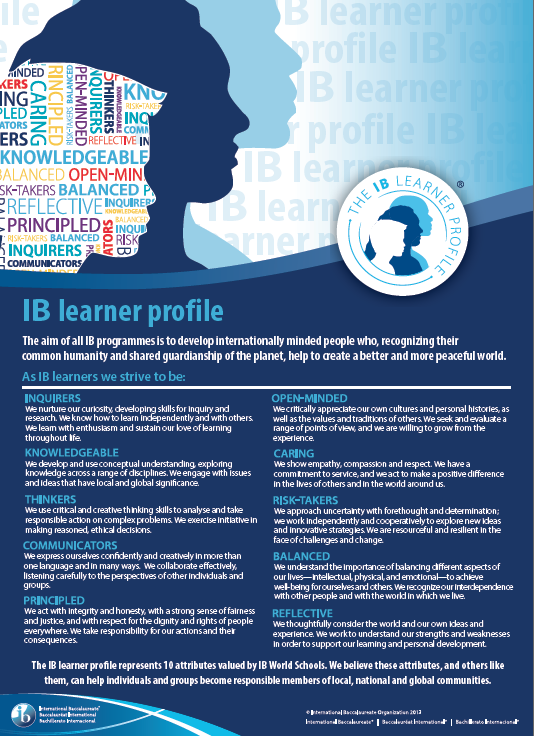 At the heart of the International Baccalaureate programme is the Learner Profile. The Learner Profile is made up of 10 attributes that we, as an IB school, strive to instill in our students. At our school, we are focusing on one attribute each month. For example, this month’s attribute is Open-Minded. We try to incorporate the monthly attribute into the activities that we do at school. At the end of each week, a student offers a reflection on the intercom pertaining to the monthly attribute. Classroom learning activities are planned with the monthly (and other) attributes in mind. Check out our twitter feed to see some of the things that are going on in our fantastic school. Hmmm…looks pretty similar to the IB Learner Profile…the words are a little bit different but I think the concept is pretty similar. There are some pretty strong correlations between the IB profile and the Alberta Education cross-curricular competencies. My daughters have been in an IB school for the past two years and they (and I) love it. I’m glad that you’ve joined us for #oclmooc, I am looking forward to learning with you. Thanks for taking the time to write a comment, Rhonda. You are right, the IB principles are amazing. You are doing a stellar job with #oclmooc…kudos! Yes, the IB principles are so similar to the cross curricular competencies! Do teachers in your school plan together for school wide activities to address the principles? We used to do something like this at my school for virtues. We had a committee of people that would brainstorm school wide activities and create packages of resources. Every month when we would start a new virtue, each teacher would receive their package of resources in their mailbox. 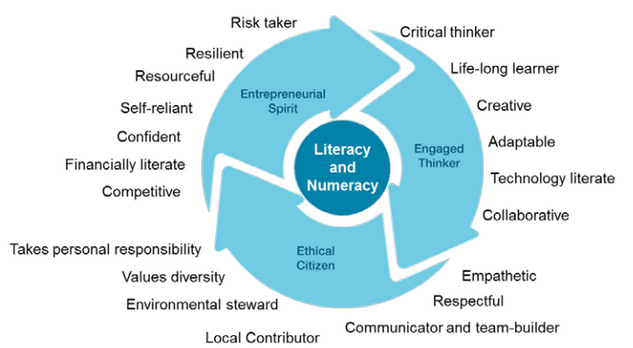 All of these competencies are traits I hope my students will develop throughout their schooling. I am happy to see the shift away from a focus on content to a focus on competencies in Alberta’s curriculum redesign. Thanks for the comment, Christine. It sounds like the planning and collaboration in our school is very similar to that of your former school. It is great when teachers can come together and plan activities and lessons around a theme. You are right, it is great to see the focus change from content to competencies but now we are faced with the challenge of assessing these skills and competencies.